Buy things and get cash using the money in your checking account with an ATM/Debit card. It's easy to use and gives you 24 hour access to your money. Plus, get 10 cents back on every debit card purchase you sign for – pick this bonus when you open spendIT checking. How do I get cash? Check out all of these ways! (where available). This is a great way to avoid fees! checking account? Yes. The money is pulled from this account when you use your ATM/Debit card. to buy stuff? Swipe your card anywhere Visa is accepted, then use your PIN or sign your name to complete the transaction. pay for the purchase or withdrawal at an ATM. * If other ATM owners charge a fee, you will have to pay it and the fee will be listed on your statement. 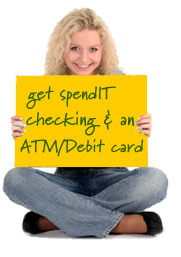 Visa ATM/Debit cards are only available with a spendIT Checking account. Once your application is received your card will arrive in 10-14 days, followed by your PIN a few days later so watch your mail carefully! Important Q&A to check out! Considering a prepaid card instead?